So let’s talk about the New York Comic Con! It was last week and was there on Friday and Saturday. With not having any major interest in the Wizard World Philadelphia show and having prior commitments for the Baltimore Comic Con, this would be my big comics event for the year. Friday was a beautiful, if not slightly chilly day in Manhattan. 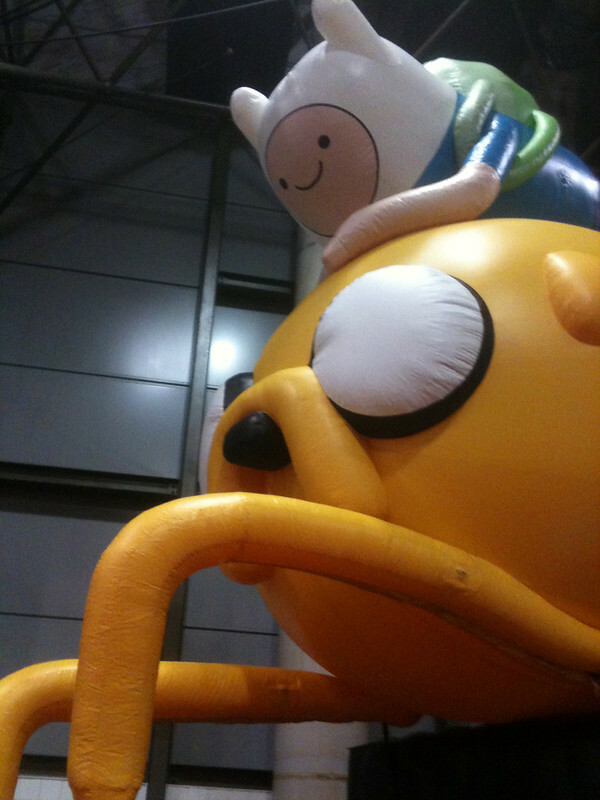 The Javits Center was packed with all kinds of geeky goodness. This is the third NYCC I’ve attended and I think this might have been the biggest yet. There weren’t as many of the huge displays (Hasbro wasn’t there), but there was a seemingly larger, unending number of publisher booths. When it came to the larger publishers, it was pretty hard to navigate their sections as every comic book fan in the northeast was there. The whole weekend, the DC area was completely packed. They could have been giving away bars of gold for all I know. The Marvel booths were similarly busy, but it was a bit easier to talk to some of the creators. Especially if they were signing at the same time as someone super popular. So to this, I can really thank Dan Slott. With the majority of the line waiting to speak to him, I was able to sneak around the crowd to speak to some of the other creators. I really didn’t buy too much stuff at the show, mostly some of the New 52 issues that I hadn’t picked up initially or stuff that was recommended. And some 1980s X-Men stuff. The artist’s alley was huge and that’s where I spent most of my time, chatting it up with artists that I knew and discovered. Saturday was ridiculously crowded, almost to the point of a stand still. It was packed; it felt like leaving Madison Square Garden after an event. I think every single inch of space of the Javits was filled. 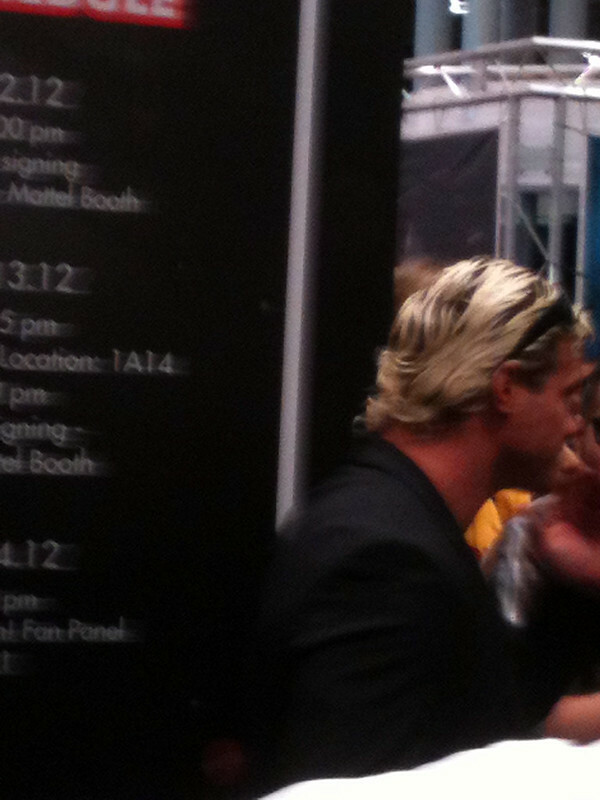 The picture above is of WWE superstar Dolph Ziggler, who was doing a signing at the Mattel booth. It reminded me of a zombie horror movie, as he was backed into a corner with people EVERYWHERE. I spent maybe five hours at the show on Saturday, only to leave with the new Sorceress from Masters of the Universe figure, signed up for Marvel’s DCU Online service (something I was meaning to do since my birthday and was worth it to not only get an exclusive Doctor Doom figure as well as a heft discount), some fine pens for drawing and some more comics. I had a lot of fun, as always. Sometimes I would have liked to have gotten into some of the panels, but I had more fun wandering around looking at comics and toys. I give it a thumbs up; if you live in the greater NYC area, you should definitely check it out. But what’s the best part of New York Comic Con and any trip to New York City? Dollar pizza. 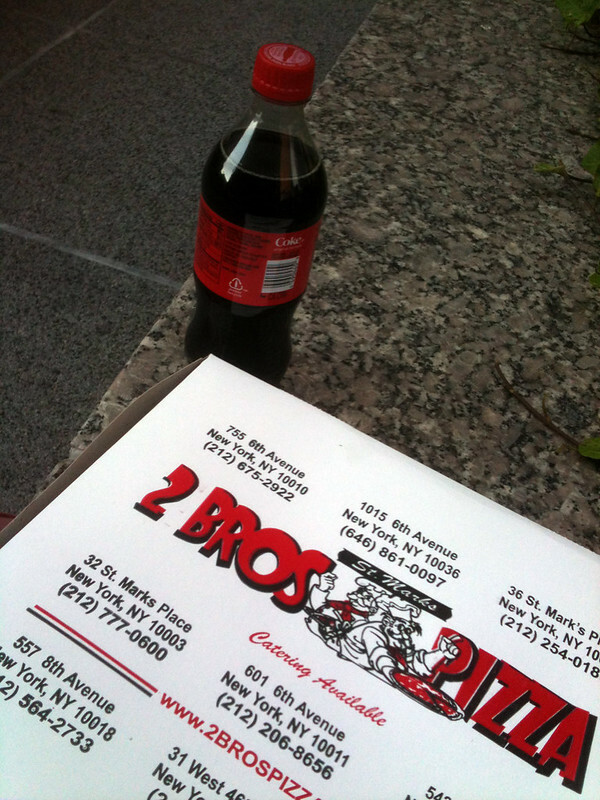 And in particular, 2 Bros Pizza. For about four bucks each day I gorged myself on their slices and loved life. I think this just might be my favorite pizza place in the city. Check back later; I have some pics of the toys I picked up and the sketches I got. 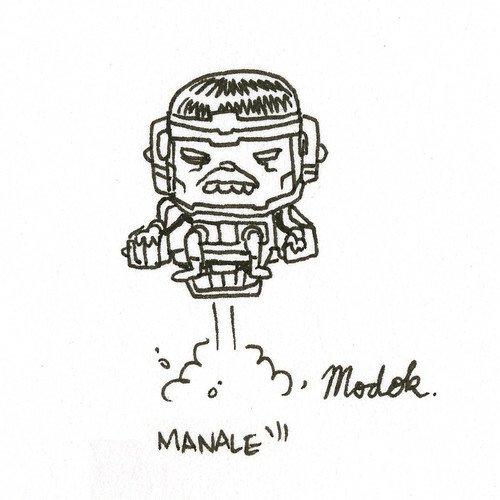 Steve Manale is the artist behind the strip Superslackers, and here is his rendition of everyone’s favorite pint-sized floating head, MODOK! You can see all kinds of cool stuff from Steve here. I’m still recovering from Thanksgiving dinner! 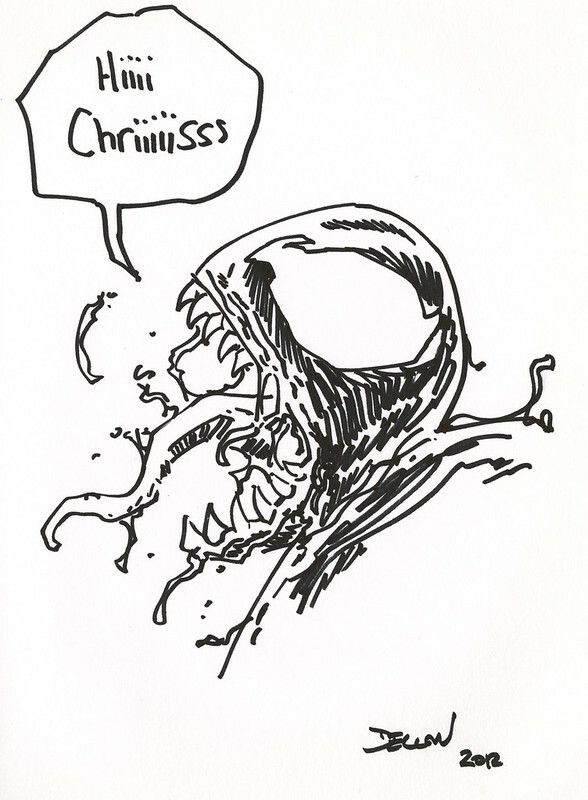 Here’s a sketch of the new Flash Thompson Venom that’s been popping up in the Marvel Universe by writer Dan Slott. I know your probably confused, why did I get the writer to draw a sketch? Aside from it being unique, a lot of writers draw some funny stuff and are very creative on the fly. 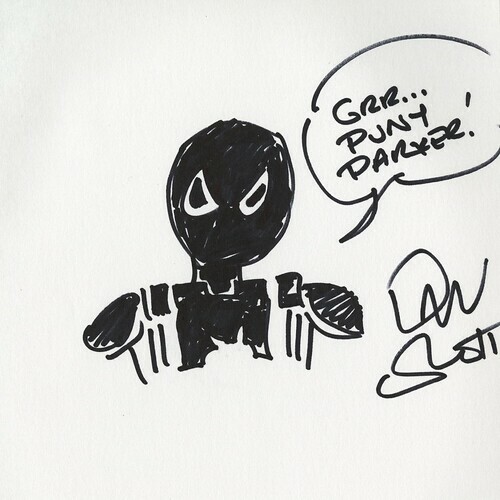 I like how Dan made Venom not only look angry, but the little quote added so much to the sketch. This is going to be the only post for the day, and we’ll get back on track for tomorrow! 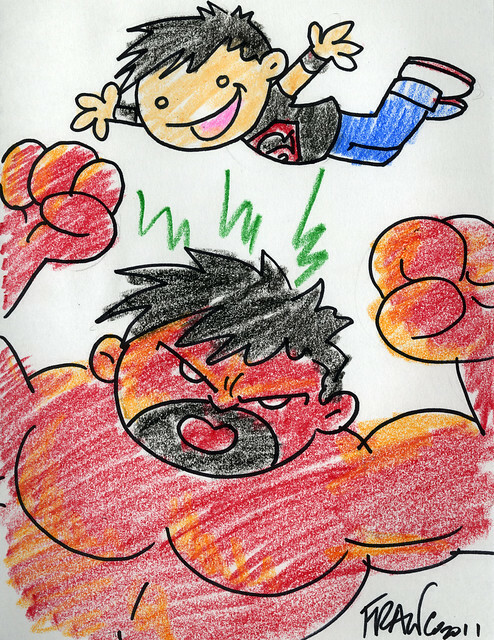 What would happen if the Red Hulk met Superboy? Tiny Titans co-mastermind Franco Aureliani assumes it would go something like this. Superboy would wind up annoying Rulk. Lets face it; poor Red Hulk isn’t necessarily the life of the party and wouldn’t take to kindly to Superboy flyring around and annoying him like a gnat. Check out Franco’s website to keep up with his projects. 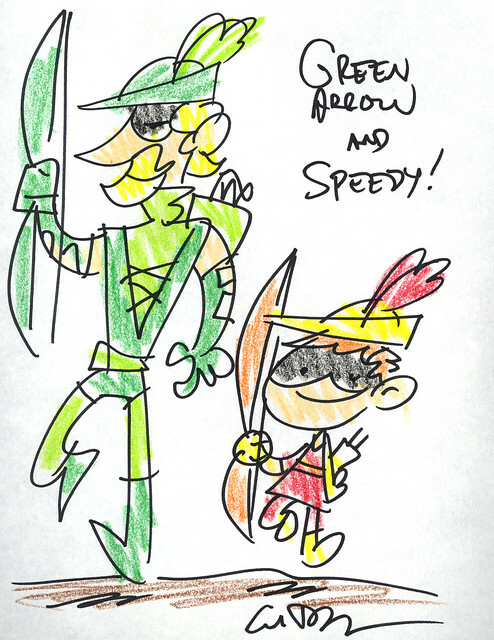 How awesome is Green Arrow and his sidekick Speedy? This sketch was from Art Baltazar of Tiny Titans and Patrick the Wolf Boy fame. I love how Green Arrow just looks like his usual tall, regal awesome self. Speedy looks really happy to be with his mentor, with that optimistic look that we all had when we were younger. This shows a happier time in his life, before he had problems that were caused by drugs or cats. Check out Art’s other projects here. I think one of my highlights from New York Comic Con was getting a chance to meet and speak with Whilce Portacio. 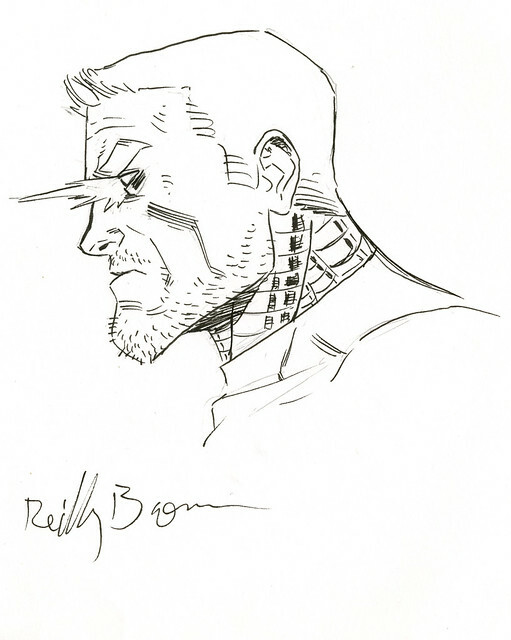 I’ve been a fan of his for a long time, and I consider him to be one of the best comic artists from the 1990s. His runs on the various X-books and his own Wetworks projects are some of my favorite stuff from that era. I got to talk with Whilce at the Marvel booth about a bunch of things, including his favorite projects, some ideas he would like to pitch and even his upcoming run on Incredible Hulk. After such a great pitch, I’m sold. 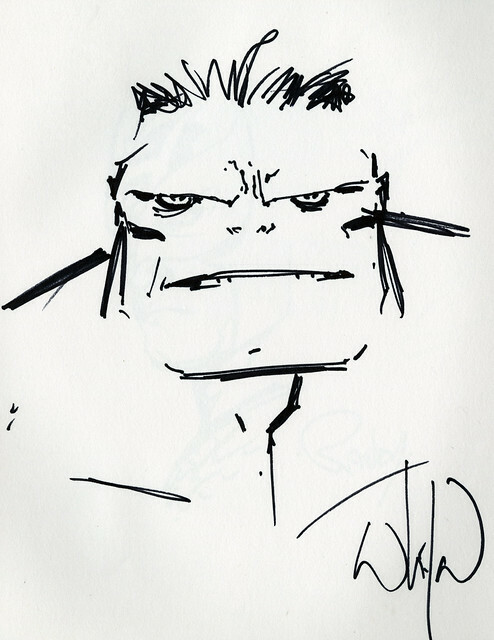 That said, I was super excited to get this Hulk sketch from him. 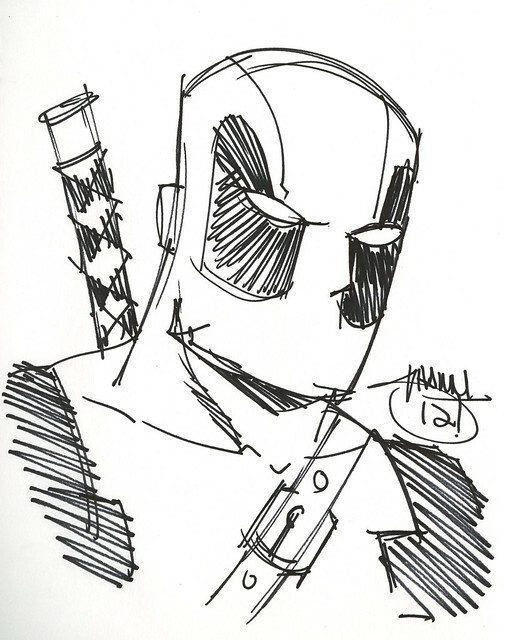 I love that it was a quick sketch and his style permeates it. Check out Whilce’s website to see some of the current stuff he’s working on. His run on Hulk starts in January. 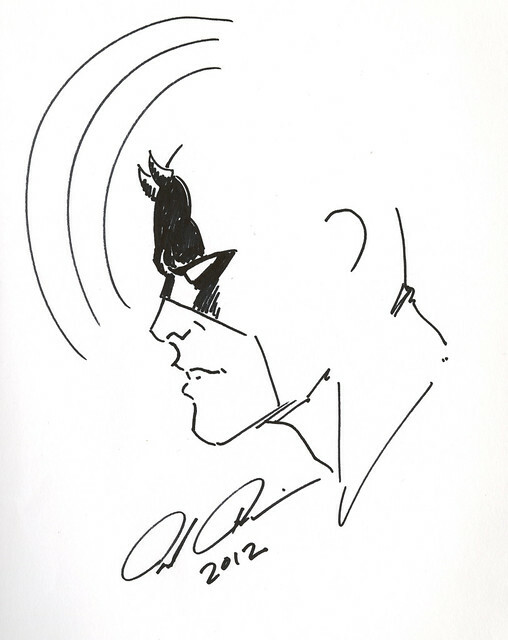 At New York Comic Con, I also got this quick head sketch from everyone’s favorite archer Hawkeye! 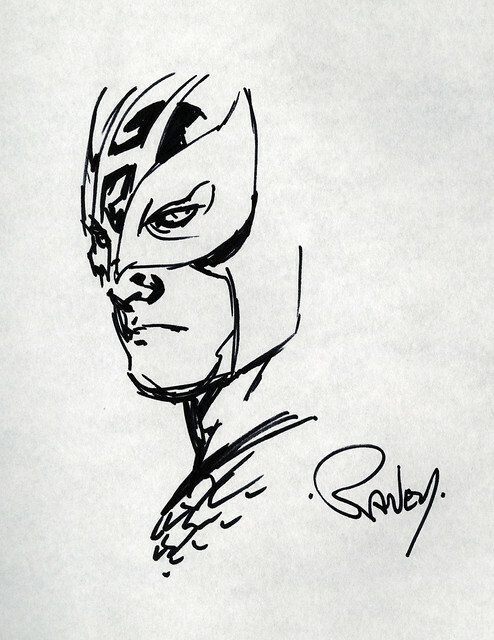 It’s by Tom Raney, who is currently working on Marvel’s Avengers Academy. 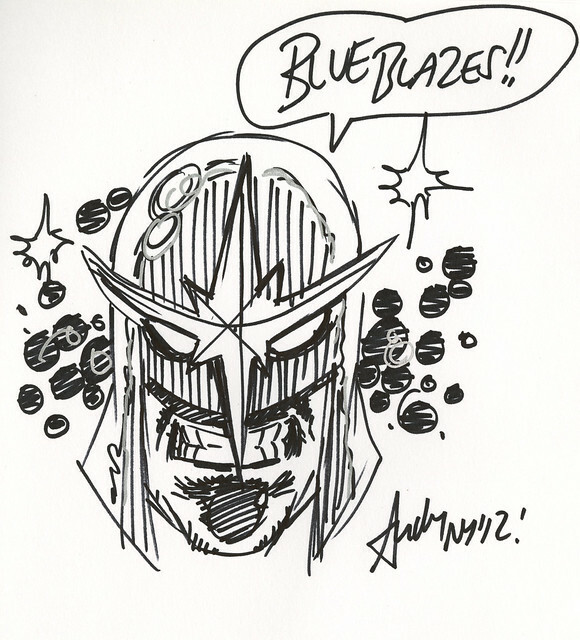 I’ve been a big fan of many of his stuff over the years, so I was super happy to not only get the chance to talk comics with him but he was generous enough to get this sketch! 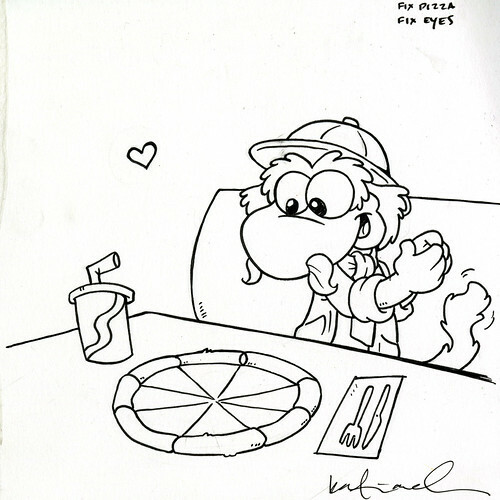 Super fans of my blog will remember that he also is responsible for the first sketch I ever got at a convention! One of the best parts of going to any comic comic book show is the chance to get sketches or original art. I was lucky to get this awesome picture of Uncle Travelling Matt from Fraggle Rock at the New York Comic Con 2011! It’s by Katie Cook, who we’ve mentioned before. I thought it was awesome that she had this for sale in her portfolio, since we all know I’ve been on a bit of an Uncle Travelling Matt kick now and again. Matt’s sitting down–excitably–to a pizza. Under normal situations, I’d be happy for pizza. I would be doubley excited to see him hanging around a pizza parlor. What kind of soda do you think he’s drinking? I think I would assume that he would be a big drinker of ginger ale. It fits his character very well. I don’t remember him eating pizza on the show, but this clip does the trick. He’s so right about barbecue gender politics, with the ladies on one side and dudes on the other.